Being told where you're going wrong isn't a bad thing, says Infinity Ward's creative strategist; it's vital to helping you improve. Infinity Ward, the studio behind the Modern Warfare games, isn't worried about getting negative feedback; if anything, the reverse is true, with the studio actually embracing it. Robert Bowling says that listening to criticism helps give Infinity Ward a more grounded perspective, and makes it easier to identify where it could be doing better. Bowling said that it would be very easy for Infinity Ward to look at the massive sales figures for Call of Duty and the number of people playing the Modern Warfare games on services like PSN and Xbox Live, and think that its work was done. But going online, where people weren't afraid to speak their minds about something they didn't like, showed the studio that there was always room for improvement. "It allows you to have a gut check and a perspective that 'this is where we still need to go,'" Bowling said. "'This is work that we still need to do.'" According to Bowling, the best decision he had ever made - at least from a developmental point of view - was joining Twitter. "It allows you to not rest on acclaim alone, whether critical or commercial," he explained. "And makes you realize that there are still audiences out there that want to enjoy your games that may not even play shooters." 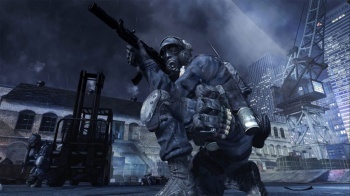 He said that the survival mode in Modern Warfare 3 - which is designed to give a multiplayer-style experience to single player fans - was a result of feedback from Twitter.